For inflexible and flexible golfers alike, finding the proper turn of the shoulders can be a little confusing or frustrating. 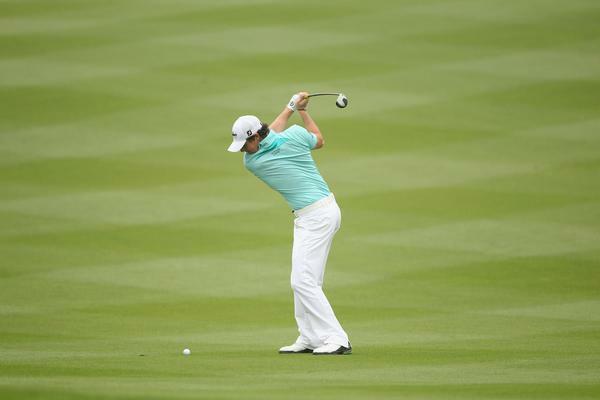 Many golfers over-rotate and/or breakdown their left side or just don’t know where their shoulders should be. There are lots of faults golfers make when it comes to making a proper turn of the shoulders. -Some golfers just swing with their arms and don’t rotate the shoulders at all or very little. -Other players actually just tilt their shoulders. -There are also recreational players (even good players) believe that 90 degrees is their absolute maximum turn, when the can actually load up more and are costing themselves lots of distance. -And, there is always the people who think they can’t get to 90 degrees due to a lack of flexibility. So, they think physical limitations are what is holding their game back and/or keeps them from playing good golf. If you are confused about shoulder turn, check out this article titled, “What is a Full Turn?” from the fairly-animated long-drive champion, Monte Scheinblum at GolfWRX. Scheinblum is a highly credited golf instructor and seems to despise the PGA of America. In the above article, he makes the process of finding your maximum shoulder turn very easy and gives beginner (& even seasoned golfers) an excellent test and/or reference point to help you find your current maximum turn for your golf swing. It’s probably best to dismiss his ranting and ravings, but reading this article carefully may help you find your way to a great golf swing..